The unconscious mind (often simply called the unconscious) is all the processes of the mind which are not available to consciousness. The term unconscious mind was coined by the 18th century German romantic philosopher Friedrich Schelling and later introduced into English by the poet and essayist Samuel Taylor Coleridge. The concept gained prominence due to the influence of Austrian neurologist Sigmund Freud. Unconscious phenomena have been held to include repressed feelings, automatic skills, unacknowledged perceptions, thoughts, habits and automatic reactions, complexes, hidden phobias and desires. Within psychoanalysis the cognitive processes of the unconscious are considered to manifest in dreams in a symbolical form. Thus the unconscious mind can be seen as the source of dreams and automatic thoughts (those that appear without any apparent cause), the repository of forgotten memories (that may still be accessible to consciousness at some later time), and the locus of implicit knowledge (the things that we have learned so well that we do them without thinking). It has been argued that consciousness is influenced by other parts of the mind. These include unconsciousness as a personal habit, being unaware, and intuition. Terms related to semi-consciousness include: awakening, implicit memory, subliminal messages, trances, hypnagogia, and hypnosis. While sleep, sleep walking, dreaming, delirium and comas may signal the presence of unconscious processes, these processes are not the unconscious mind itself, but rather symptoms. Some critics have doubted the existence of the unconscious. The term unconscious mind was coined by the 18th century German romantic philosopher Friedrich Schelling and later introduced into English by the poet and essayist Samuel Taylor Coleridge. Articulating the idea of something not conscious, or, actively denied to awareness, with the constructs of language has been a process of human thought and interpersonal influence for millennia. For example, influences on thinking that originate from outside of an individual's consciousness were reflected in the ancient ideas of temptation, divine inspiration, and the predominant role of the gods in affecting motives and actions. The idea of internalised unconscious processes in the mind was also instigated in antiquity and has been explored across a wide variety of cultures. Unconscious aspects of mentality were referred to between 2500 and 600 BC in the Hindu texts known as the Vedas, found today in Ayurvedic medicine. Paracelsus is credited as the first to make mention of an unconscious aspect of cognition in his work Von den Krankheiten (translates as "About illnesses", 1567), and his clinical methodology created a cogent system that is regarded by some as the beginning of modern scientific psychology. William Shakespeare explored the role of the unconscious in many of his plays, without naming it as such. In addition, Western philosophers such as Baruch Spinoza, Gottfried Leibniz, Arthur Schopenhauer, S?ren Kierkegaard, and Friedrich Nietzsche, developed a western view of the mind which foreshadowed Freud's theories. Psychologist Jacques Van Rillaer points out that, "the unconscious was not discovered by Freud. In 1890, when psychoanalysis was still unheard of, William James, in his monumental treatise on psychology, examined the way Schopenhauer, von Hartmann, Janet, Binet and others had used the term 'unconscious' and 'subconscious'". Historian of psychology Mark Altschule observes that, "It is difficult - or perhaps impossible - to find a nineteenth-century psychologist or psychiatrist who did not recognize unconscious cerebration as not only real but of the highest importance." Some neuroscientific research supports the existence of the unconscious mind. For example, researchers at Columbia University Medical Center have found that fleeting images of fearful faces - images that appear and disappear so quickly that they escape conscious awareness - produce unconscious anxiety that can be detected in the brain with the latest neuroimaging machines. The conscious mind is thus hundreds of milliseconds slower than unconscious processes. To understand this type of research, a distinction has to be made between unconscious processes and the unconscious mind (neuroscientists are far more likely to examine the former). The unconscious mind and its expected psychoanalytic contents unconsciousness, coma, and a minimally conscious state. The difference in the uses of the terms can be explained, to a degree, by our different hypotheses on its subject. One such conjecture is the psychoanalytic theory. Sigmund Freud (6 May 1856 - 23 September 1939), was an Austrian neurologist who founded the discipline of psychoanalysis. Freud's family and ancestry were Jewish. Freud always considered himself a Jew even though he rejected Judaism and had a critical view of religion. Freud's parents were poor, but ensured his education. Freud was an outstanding pupil in high school, and graduated the Matura with honors in 1873. Interested in philosophy as a student, Freud later turned away from it and became a neurological researcher into cerebral palsy, Aphasia and microscopic neuroanatomy. 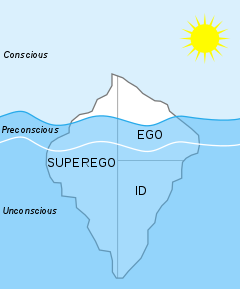 Although Freud's theories are controversial, an iceberg is often used to illustrate that most of the human mind operates unconsciously. Sigmund Freud and his followers developed an account of the unconscious mind. It plays an important role in psychoanalysis. Freud divided the mind into the conscious mind (or the ego) and the unconscious mind. The latter was then further divided into the id (or instincts and drive) and the superego (or conscience). In this theory, the unconscious refers to the mental processes of which individuals make themselves unaware. Freud proposed a vertical and hierarchical architecture of human consciousness: the conscious mind, the preconscious, and the unconscious mind - each lying beneath the other. He believed that significant psychic events take place "below the surface" in the unconscious mind, like hidden messages from the unconscious. He interpreted such events as having both symbolic and actual significance. In psychoanalytic terms, the unconscious does not include all that is not conscious, but rather what is actively repressed from conscious thought or what a person is averse to knowing consciously. Freud viewed the unconscious as a repository for socially unacceptable ideas, wishes or desires, traumatic memories, and painful emotions put out of mind by the mechanism of psychological repression. However, the contents did not necessarily have to be solely negative. In the psychoanalytic view, the unconscious is a force that can only be recognized by its effects - it expresses itself in the symptom. In a sense, this view places the conscious self as an adversary to its unconscious, warring to keep the unconscious hidden. Unconscious thoughts are not directly accessible to ordinary introspection, but are supposed to be capable of being "tapped" and "interpreted" by special methods and techniques such as meditation, free association (a method largely introduced by Freud), dream analysis, and verbal slips (commonly known as a Freudian slip), examined and conducted during psychoanalysis. Seeing as these unconscious thoughts are normally cryptic, psychoanalysts are considered experts in interpreting their messages. Freud later used his notion of the unconscious in order to explain certain kinds of neurotic behavior. Nevertheless, Freud's theory of the unconscious was substantially transformed by some of his followers, among them Carl Jung and Jacques Lacan. Carl Gustav Jung, a Swiss psychiatrist, developed the concept further. He divided the unconscious into two parts: the personal unconscious and the collective unconscious. The personal unconscious is a reservoir of material that was once conscious but has been forgotten or suppressed, much like the typical notion of the unconscious to Freud. The collective unconscious, however, is the deepest level of the psyche, containing the accumulation of inherited psychic structures and archetypal experiences. The collective unconscious is therefore said to be inherited and contain material of an entire species rather than of an individual. In addition to the structure of the unconscious, Jung differed from Freud in that he did not believe that sexuality was at the base of all unconscious thoughts. Jacques Lacan's psychoanalytic theory contends that the unconscious is structured like a language. In Lacan's view, the unconscious is not a more primitive or archetypal part of the mind separate from the conscious, linguistic ego, but an equally complex and linguistically sophisticated formation. Lacan's idea of how language is structured is largely taken from the structural linguistics of Ferdinand de Saussure and Roman Jakobson, based on the function of the signifier and signified in signifying chains. There are still fundamental disagreements within psychology about the nature of the unconscious mind. There is controversy as to the scientific validity of the concept of the unconscious, and whether the unconscious mind exists at all has been disputed. Franz Brentano rejected the concept of the unconscious in his 1874 book Psychology from an Empirical Standpoint, although his rejection followed largely from his definitions of consciousness and unconsciousness. In the social sciences, John Watson, considered to be the first American behaviourist, criticized the idea of an "unconscious mind," and instead focused on observable behaviors rather than on introspection. David Holmes examined sixty years of research about the Freudian concept of "repression", and concluded that there is no positive evidence for this concept. Given the lack of evidence of many Freudian hypotheses, some scientific researchers proposed the existence of unconscious mechanisms that are very different from the Freudian ones. They speak of a "cognitive unconscious" (John Kihlstrom), an "adaptive unconscious" (Timothy Wilson), or a "dumb unconscious" (Loftus & Klinger), which executes automatic processes but lacks the complex mechanisms of repression and symbolic return of the repressed. Jean-Paul Sartre offers a critique of Freud's theory of the unconscious in Being and Nothingness, based on the claim that consciousness is essentially self-conscious. Sartre also argues that Freud's theory of repression is internally flawed, although Thomas Baldwin writes that his argument is based on a misunderstanding of Freud. Ludwig Wittgenstein and Jacques Bouveresse argued that Freudian thought exhibits a systemic confusion between reasons and causes: the methods of interpretation can give reasons for new meanings, but are useless to find causal relations (which require experimental research). Wittgenstein gave the following example (in his Conversations with Rush Rhees): if we throw objects on a table, and we give free associations and interpretations about those objects, we'll find a meaning for each object and its place, but we won't find the causes. Another contemporary philosopher, John Searle, has offered a critique of the Freudian unconscious. He contends that the very notion of a collection of "thoughts" that exist in a privileged region of the mind such that they are in principle never accessible to conscious awareness, is incoherent. This is not to imply that there are not "nonconscious" processes that form the basis of much of conscious life. Rather, Searle simply claims that to posit the existence of something that is like a "thought" in every way except for the fact that no one can ever be aware of it (can never, indeed, "think" it) is an incoherent concept. To speak of "something" as a "thought" either implies that it is being thought by a thinker or that it could be thought by a thinker. Processes that are not causally related to the phenomenon called thinking are more appropriately called the nonconscious processes of the brain. These ideas are discussed at greater length in his book The Rediscovery of the Mind. Other critics of the Freudian unconscious are David Stannard, Richard Webster, and Ethan Watters and Richard Ofshe. In modern cognitive psychology, many researchers have sought to strip the notion of the unconscious from its Freudian heritage, and alternative terms such as "implicit" or "automatic" have come into currency. These traditions emphasize the degree to which cognitive processing happens outside the scope of cognitive awareness, and show that things we are unaware of can nonetheless influence other cognitive processes as well as behavior. Active research traditions related to the unconscious include implicit memory (see priming, implicit attitudes), and nonconscious acquisition of knowledge (see Lewicki, see also the section on cognitive perspective, below). While, historically, the psychoanalytic research tradition was the first to focus on the phenomenon of unconscious mental activity, there is an extensive body of conclusive research and knowledge in contemporary cognitive psychology devoted to the mental activity that is not mediated by conscious awareness. For example, an extensive line of research conducted by Hasher and Zacks has demonstrated that individuals register information about the frequency of events automatically (i.e., outside of conscious awareness and without engaging conscious information processing resources). Moreover, perceivers do this unintentionally, truly "automatically," regardless of the instructions they receive, and regardless of the information processing goals they have. Interestingly, the ability to unconsciously and relatively accurately tally the frequency of events appears to have little or no relation to the individual's age, education, intelligence, or personality, thus it may represent one of the fundamental building blocks of human orientation in the environment and possibly the acquisition of procedural knowledge and experience, in general. Another line of (non-psychoanalytic) early research on unconscious processes was initiated by using so-called "artificial grammar" methodology. That research revealed that individuals exposed to novel words created by complex sets of artificial, synthetic "grammatical" rules (e.g., GKHAH, KHABT...), quickly develop some sort of a "feel" for that grammar and subsequent working knowledge of that grammar, as demonstrated by their ability to differentiate between new grammatically "correct" (i.e., consistent with the rules) and "incorrect" (inconsistent) words. Interestingly, that ability does not appear to be mediated, or even accompanied by the declarative knowledge of the rules (i.e., individuals' ability to articulate how they distinguish between the correct and incorrect words). The gist of these early findings (from the '70s) has been significantly extended in the '80s and '90s by further research showing that outside of conscious awareness individuals not only acquire information about frequencies (i.e., "occurrences" of features or events) but also co-occurrences (i.e., correlations or, technically speaking, covariations) between features or events. Extensive research on nonconscious acquisition of information about covariations was conducted by Pawel Lewicki, followed by research of D. L. Schachter (who is known for introducing the concept of implicit memory), L. R. Squire, and others. In the learning phase of a typical study, participants were exposed to a stream of stimuli (trials or events, such as strings of letters, digits, pictures, or descriptions of stimulus persons) containing some consistent but non-salient (hidden) covariation between features or events. For example, every stimulus person presented as "fair" would also have a slightly elongated face. It turned out that even if the manipulated covariations were non-salient and inaccessible to subjects' conscious awareness, the perceivers would still acquire a nonconscious working knowledge about those covariations. For example, if in the testing phase of the study, participants were asked to make intuitive judgements about the personalities of new stimulus persons presented only as pictures (with no personality descriptions), and judge the "fairness" of the depicted individuals, they tend to follow the rules nonconsciously acquired in the learning phase and if the stimulus person had a slightly elongated face, they would report an intuitive feeling that this person was "fair". Nonconscious acquisition of information about covariations appears to be one of the fundamental and ubiquitous processes involved in the acquisition of knowledge (skills, experience) or even preferences or personality dispositions, including disorders or symptoms of disorders. Unlike in the psychoanalytic research tradition that uses the terms "unconscious", in the cognitive tradition, the processes that are not mediated by conscious awareness are sometimes referred to as "nonconscious". This term, rarely used in psychoanalysis, stresses the empirical and purely descriptive nature of that phenomenon (a qualification as simply "not being conscious") in the tradition of cognitive research. Specifically, the process is non-conscious when even highly motivated individuals fail to report it, and few theoretical assumptions are made about the process (unlike in psychoanalysis where, for example, it is postulated that some of these processes are being repressed in order to achieve certain goals). Look up Mind and Brain portal in Wiktionary, the free dictionary. Look up Unconscious Mind in Wiktionary, the free dictionary. Please browse our fully updated library of professionally produced Hypnosis Downloads and Hypnosis Scripts for advanced self hypnosis audio mp3s and indirect hypnotherapy scripts relating to: unconscious mind, unconscious mind definition, unconscious mind examples, unconscious mind facts, unconscious mind influence on behavior, unconscious mind vs conscious mind, about the unconscious mind, carl jung, collective unconscious, contemporary cognitive psychology, electra complex, exploring unconscious mind, jacques lacan, linguistic unconscious, oedipus complex, procedural knowledge, psychoanalytic unconscious, sigmund freud, unconscious processes, unconscious processing, unconsciousness versus nonconsciousness. Please browse our Hypnosis Online Store for books, cds, downloads, dvds, ebooks, mp3s, scripts, and videos relating to: unconscious mind, unconscious mind definition, unconscious mind examples, unconscious mind facts, unconscious mind influence on behavior, unconscious mind vs conscious mind, about the unconscious mind, carl jung, collective unconscious, contemporary cognitive psychology, electra complex, exploring unconscious mind, jacques lacan, linguistic unconscious, oedipus complex, procedural knowledge, psychoanalytic unconscious, sigmund freud, unconscious processes, unconscious processing, unconsciousness versus nonconsciousness. Please visit Hypnotic-world.co.uk for advanced self hypnosis audio mp3s, hypnosis courses, and hypnosis pdf relating to: unconscious mind, unconscious mind definition, unconscious mind examples, unconscious mind facts, unconscious mind influence on behavior, unconscious mind vs conscious mind, about the unconscious mind, carl jung, collective unconscious, contemporary cognitive psychology, electra complex, exploring unconscious mind, jacques lacan, linguistic unconscious, oedipus complex, procedural knowledge, psychoanalytic unconscious, sigmund freud, unconscious processes, unconscious processing, unconsciousness versus nonconsciousness. Please visit Hypnosisdownloadsshop.com for more information relating to: unconscious mind, unconscious mind definition, unconscious mind examples, unconscious mind facts, unconscious mind influence on behavior, unconscious mind vs conscious mind, about the unconscious mind, carl jung, collective unconscious, contemporary cognitive psychology, electra complex, exploring unconscious mind, jacques lacan, linguistic unconscious, oedipus complex, procedural knowledge, psychoanalytic unconscious, sigmund freud, unconscious processes, unconscious processing, unconsciousness versus nonconsciousness.